Misty May-Treanor was one of the greatest all-around high school indoor volleyball players while competing at Newport Harbor where she set and hit her team to two California State titles. She was named both CIF Player of the Year and the ‘USA Today’ National Player of the Year. She went on to a tremendous college career at Long Beach State where she set the 49ers to the Volley Four in 1997 and was National Player of the Year. In 1998 she had one of the greatest college seasons of all-time playing for Brian Gimmillaro with Debbie Green as her setting mentor. The All-American set her team to the first unbeaten season in NCAA history in winning the title when the 49ers rallied from an 8-3 fifth set deficit. She was NCAA Co-MVP and National Player of the Year. She set a NCAA playoff serving ace record of 20 in the 1998 title season. 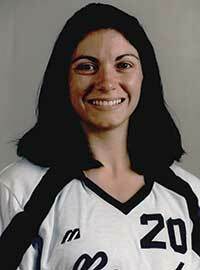 May-Treanor won the Honda Award as the top college volleyball player and went on to be only the second volleyball player to ever win the Honda-Broderick Cup as the top overall female college athlete. After college, May-Treanor went to the USA Indoor National Team program before turning to an amazing beach career. She won Olympic beach gold medals in 2004, 08, & 12 with Kerri Walsh and was second all-time in beach victories. She is currently the Long Beach CC Women’s Head Coach. She was selected as a member of the International VB HOF in 2016.